My younger sister asked me to design a crochet sun hat for her. And this is what I came up with: a lacy sun hat with a wavy brim - named after my sister's nickname - Ciuci! 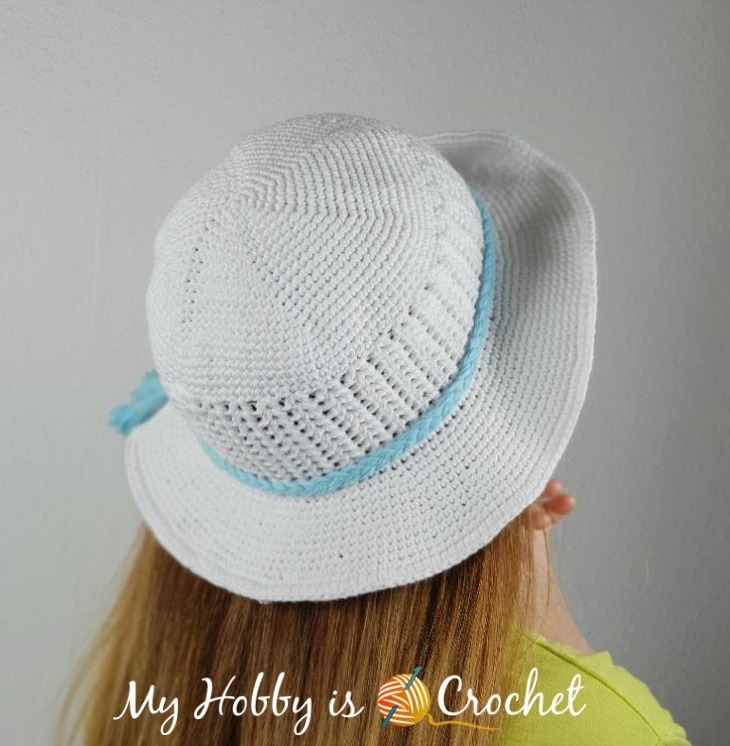 This sun hat is worked with easy crochet stitches, such as single crochet and half double crochet. Here is how it looks simple, without the braiding. NOTES: The hat is started at the top using single crochet stitches worked in spiral rounds, without joining. Place a stitch marker into top of first stitch, move the stitch marker as you go, placing it always into the first st of the round. Once you begin the lace pattern, the rounds will be joined with slip stitches. 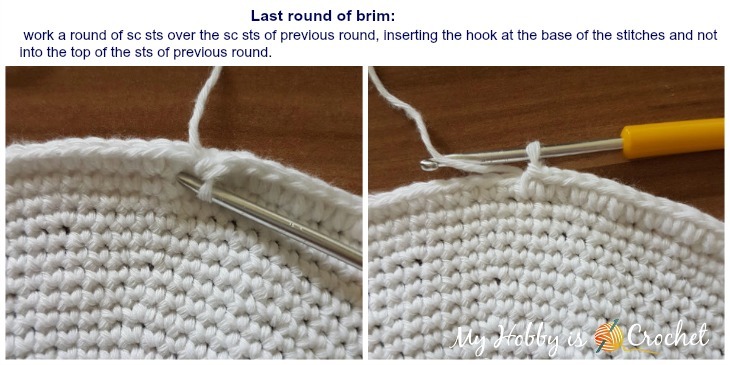 The joining at the end of the rounds will be made into the top of the first stitch, not into the beginning ch1. - ch1sp: the chain 1 space here will be the ch space in the middle of the hdc-V st. Round 1: With main color yarn make a magic ring. Ch1, work 6 sc into ring. 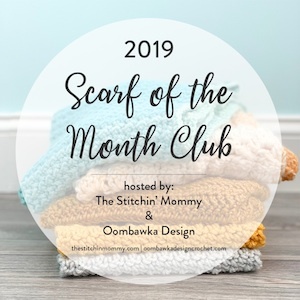 Do not join with slip stitch! Continue working the next rounds in a continuous spiral! Do not ch 1 at the beginning of the next rounds! At the end of round 22, join with sl st to top of first sc of the round. You will not need the stitch marker anymore! Rounds 25-33: Repeat as round 2. The cap measures 17 cm height. Round 13: ch 1, work a round of sc sts over the sc sts of previous round (basically you will insert the hook into the top of the sts 2 rounds below). 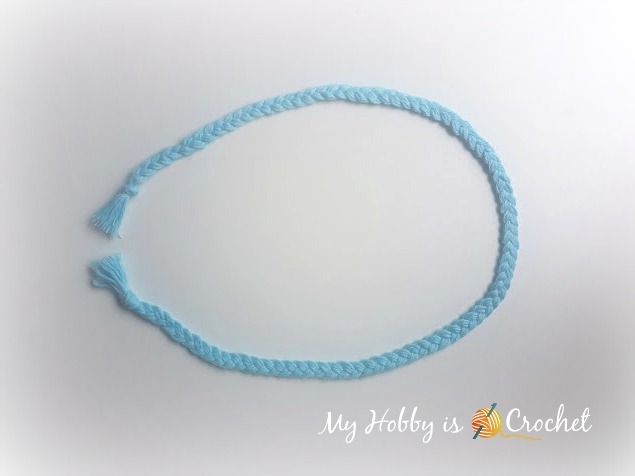 Braided Cord: Cut 9 lengths contrasting yarn of 1 metre each. Make a basic 3 strand flat braid, holding each 3 strands of yarn together. The finished braided strand measures 75 cm. Knot the ends of the braid using an adjustable knot and place it on your sun hat, above the brim. After trying it on your head, you can adjust the circumference of the braided strand. 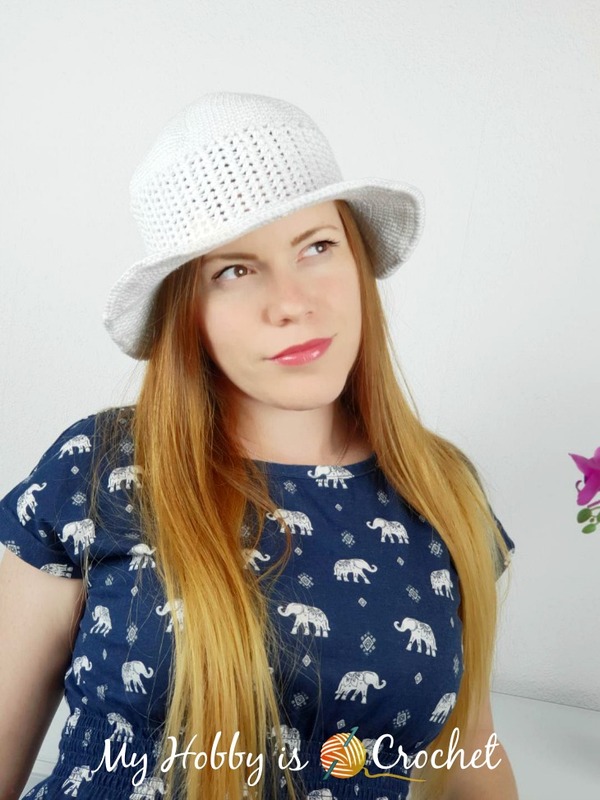 Now you can sew the braid onto the hat if you like; you can also let it removable and make several color braids, changing them to fit your outfits. Tip: Iron the brim around to give it more firmity. A fabric stiffener would be a good idea too.